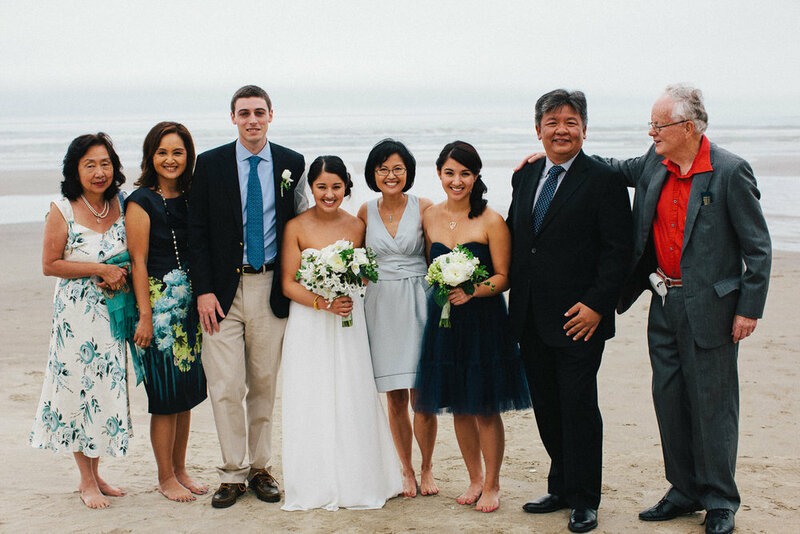 Parissa & Tommy were married at SURFSAND RESORT near Haystack Rock in Cannon Beach. They planned their beach wedding while living in Chicago, and took just a few trips out to plan. The couple worked with KATY and infused both Persian and Chinese traditions to honor the bride’s parents. The family connected so well with Katy that they have cerebrated holidays together! OREGON BRIDE MAGAZINE agreed that this was a beautiful wedding and decided to feature it in their current issue! Parissa’s mom, Poh (who is as cute as can be), had guests write messages on a fabric square at the welcome reception in Portland. On the wedding day she had the closest family & friends squares sewn closest to the center, with extra squares for other guests to sign who hadn’t already. Afterwards she created a beautiful quilt for the newlyweds! Parissa’s dad walked her down to the first look with her groom. I love this! Parissa & Tommy had a Catholic ceremony at St. Peter the Fisherman Catholic Church. After the ceremony, guests were welcomed to the hotel with a traditional TEA CEREMONY as a nod to Poh’s Chinese background. Following the Chinese Tea Ceremony was an outdoor Cocktail Hour. The Ballroom at Surfsand was laid out with long tables, gorgeous flowers and elegant chiavari chairs. This cute favor bag included the couple’s favorite salt water taffy. DESIGN BAND does it again! Never been at a party they’ve performed at without having tons of fun! CLICK HERE for more photos from this wedding.